"Minnesota Deaths and Burials, 1835-1990," database, FamilySearch (https://familysearch.org/ark:/61903/1:1:FDX3-481 : 4 December 2014), Shirley K Fifield in entry for Child Fifield, 03 Nov 1909; citing Minnesota, United States, reference 17824; FHL microfilm 2,117,951. Thomas W. Baldwin, Vital Records of Cambridge, Massachusetts, to the year 1850, Boston: Wright & Potter Print. Co., (1914) , Vol. 1, p. 250. Watertown Records, Comprising the first and second books of town proceedings..., Watertown, Mass. : Fred G. Barker, (1890) , Vol. 3, p. 148. Franklin C. Clark, "The Bristol Branch of the Finney Family", The New England Historical and Genealogical Register Vol. 60 (1906): p. 69. Find A Grave Memorial# 133302024. Franklin C. Clark, "The Bristol Branch of the Finney Family", The New England Historical and Genealogical Register Vol. 60 (1906): p. 67. 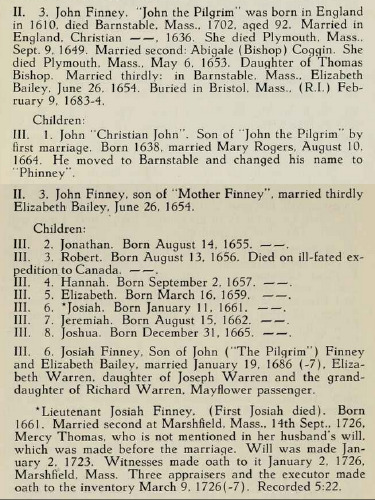 James Albert Finney, The Name and Family of Finney, , at https://archive.org/stream/clanfinley00stou . Colorado Springs, Colorado: (1953) , pp. 14-15. 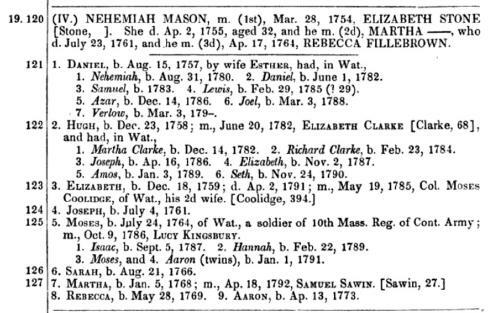 "Massachusetts Marriages, 1841-1915," database with images, FamilySearch (https://familysearch.org/ark:/61903/1:1:NWBN-6XK : 17 February 2016), Amos L. Hale and Clara Fisher, 26 Jun 1884; citing , Newton, Massachusetts, United States, State Archives, Boston; FHL microfilm 1,432,998. "United States Census, 1900," database with images, FamilySearch (https://familysearch.org/ark:/61903/1:1:M9TD-JKD : accessed 8 December 2016), Clara G Hale in household of Amos L Hale, Precinct I Newton city & Upper Falls village Ward 5, Middlesex, Massachusetts, United States; citing enumeration district (ED) 903, sheet 21A, family 428, NARA microfilm publication T623 (Washington, D.C.: National Archives and Records Administration, 1972. ); FHL microfilm 1,240,664. 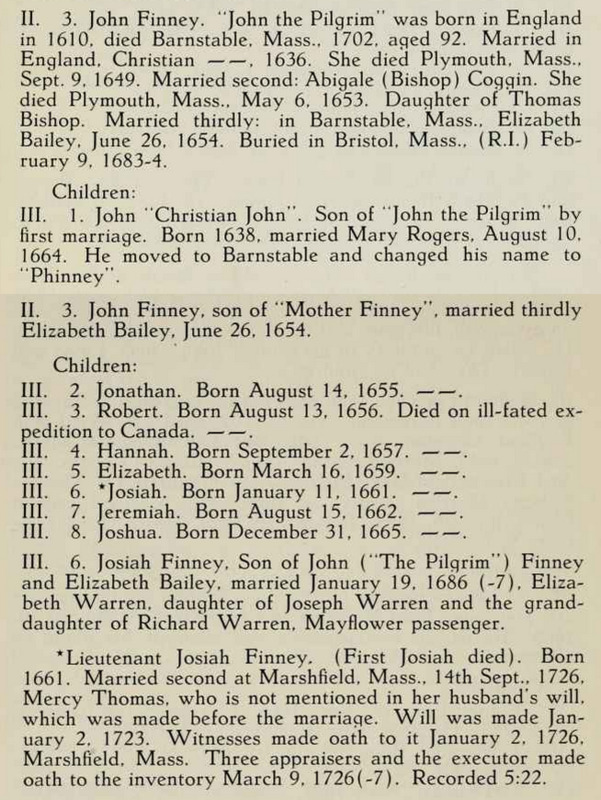 "Maine Births and Christenings, 1739-1900," database, FamilySearch (https://familysearch.org/ark:/61903/1:1:FWBH-ZRW : 4 December 2014), Olive Hixon Fisher, 19 Sep 1819; citing Charlotte, Washington, Maine; FHL microfilm 10,806. "United States Census, 1880," database with images, FamilySearch (https://familysearch.org/pal:/MM9.3.1/TH-1942-25145-6846-92?cc=1417683 : 24 December 2015), Massachusetts > Plymouth > Scituate > ED 551 > image 27 of 52; citing NARA microfilm publication T9 (Washington, D.C.: National Archives and Records Administration, n.d.). 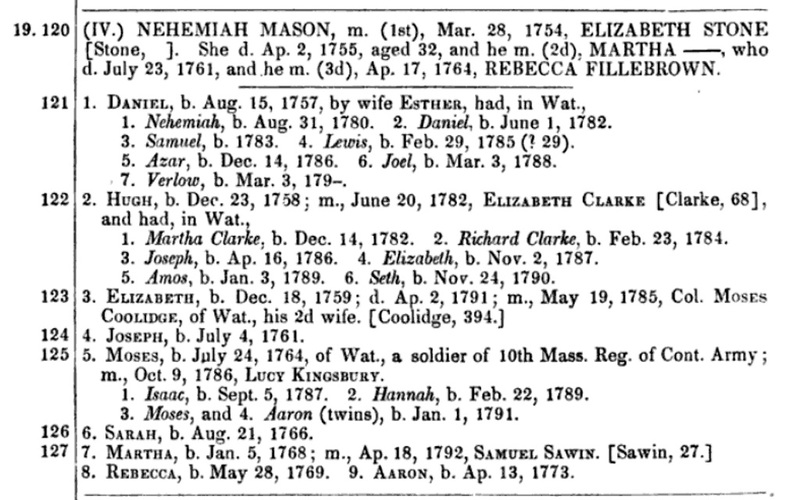 "Massachusetts Births, 1841-1915", database with images, FamilySearch (https://familysearch.org/ark:/61903/1:1:FXWT-J9W : 1 March 2016), Emily L. Lee, 1847. "Massachusetts Births, 1841-1915", database with images, FamilySearch (https://familysearch.org/ark:/61903/1:1:FXCQ-GS7 : 1 March 2016), Lee, 1851. Record added: Aug 21, 2009. "United States Social Security Death Index," database, FamilySearch (https://familysearch.org/ark:/61903/1:1:JBKS-KJ3 : 19 May 2014), Henry H Fiske, 15 Jul 1989; citing U.S. Social Security Administration, Death Master File, database (Alexandria, Virginia: National Technical Information Service, ongoing). "Massachusetts Marriages, 1695-1910," database, FamilySearch (https://familysearch.org/ark:/61903/1:1:FHXN-2XR : 4 December 2014), Francis Winship and Catherine Fitzgerald, 31 Jan 1861; citing reference 15; FHL microfilm 818,105. 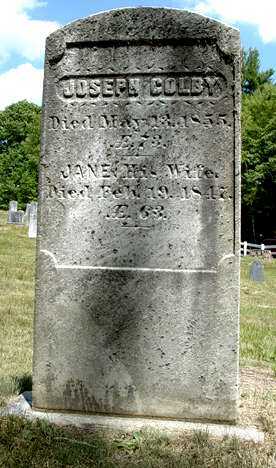 "Massachusetts Deaths, 1841-1915," database with images, FamilySearch (https://familysearch.org/ark:/61903/1:1:N7GY-XF3 : 10 December 2014), Francis Winship, 04 Aug 1885; citing Wellesley, Massachusetts, v 365 p 301, State Archives, Boston; FHL microfilm 960,229. Henry Bond, Family Memorials: Genealogies of the Families and Descendants of the Early Settlers of Watertown, Massachusetts, Including Waltham and Weston; to which is Appended the Early History of the Town, Vol. 1, , at https://books.google.com/books?id=fIc-AAAAYAAJ . Boston: Little, Brown & Company, (1855) , p. 223. Vital Records of Waltham, Massachusetts, to the Year 1850, New-England historic genealogical society, at the charge of the Eddy town-record fund, (1904) , p. 20. FamilySearch® Ancestral File™ v4.19, , Submitter: RANDELL G PAISLEY, PO BOX 11, 3040 WILSON ST, GERRY NY, 14740-0011.